Whenever there is a discussion on black money, there is a genuine mix up about domestic black money and black or illicit money kept by Indians in tax havens. These two needs to be dealt in different ways. Some part of domestic black money is used in productive activities like real estate, trade, construction, mining, transport, and restaurant businesses. The illicit money kept in tax havens is by and large not used for domestic purposes unless it is –round tripped through share markets or Foreign Direct Investment (FDI) to the domestic operations. In other words, domestic black money is a no confidence motion on the Government of India while illicit money kept abroad is a no confidence on India itself—its stability and its people. Here we look at some mechanisms which can reduce domestic black money or at least reduce its growth rate. We find that huge amount of cash is disbursed by some political parties to voters before an election and for which, cash is transported from one location to other. In Andhra Pradeshcash as high as Rs 32 crores were seized which were presumably for distribution among voters. Similar was the case in Tamil Nadu according to earlier report involving Rs 24 crore which was seized by election officials meant for disbursement among voters. Huge amounts of Cash are held not only for electoral malpractices but also for black money transaction purposes. In extreme cases, we find the former Minster Sukh Ram stuffing his pillows with cash. Time has come to bring in changes in the Coinage Act 2011 and other relevant acts to make holding of cash above a threshold level say Rs 10 lakhs punishable. This threshold can be arrived at by the Central Bank and Finance/Ministry after taking into account the requirements for average genuine cash transactions in the economy like for marriage/ death occasions or wage disbursal for individual construction activities. Obviously, banking institutions and corporate having construction /project activities where substantial amount of cash disbursal might take place are not be restricted by this limit. Of course, in developed economies like the US, there are no restrictions per se in terms of holding or transporting cash domestically except if it is suspected to be drug money. Even there, transactions beyond USD 10000 in cash are expected to be notified to IRS by the shops etc. There are restrictions in terms of immigration /emigration times the amount of Dollar one can transport. But since,, it is well developed economy most of the transactions are conducted by plastic cards or through banking channels. Taking into account our situations, we should evolve laws to prohibit holding of cash beyond a threshold level and this will go a long way in prevention huge cash holding and concomitant disbursals in black transactions. It will also hasten banking habit among large number of people which will increase financial intermediation. Associated with this is the issue of larger denominational notes in circulation and part of holding. In our country, the cash transactions are more to avoid taxes and generate black money. The higher the denominations, easier are the transactions and transportation. Domestic black money primarily dependant on cash economy and tries to avoid formal transactions like banks due to fear of being captured by electronic systems and tax authorities. 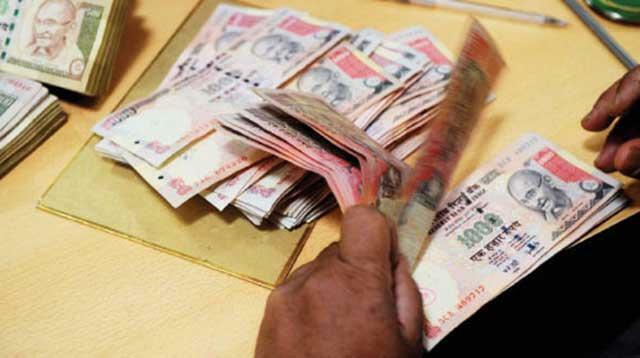 So, the holding of black money is in the form of cash and also the transactions undertaken is in the form of cash. This imply substantial portions have to be high denominational currency since carrying and transacting in cash in low denominations for large values is relatively difficult. In India, if we take only currency notes, we have the lowest denomination at Rs 1 [of course Rs 1 currency notes are phased out in terms of coins] and Rs 1000 which imply that the differential is 1000 times. In the US, the most popular highest denomination is 100 Dollars and the differential is 100 only. Not only that ,we find from table -1 that the printing and distribution of notes by RBI is also in favour of higher denominations even though poor people would transact only in lower denominations. 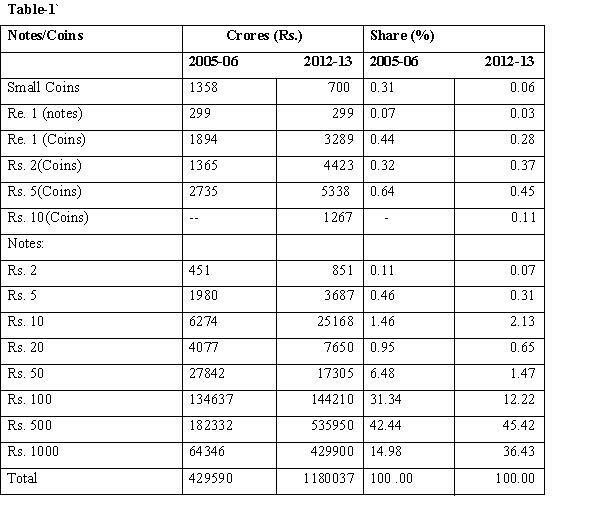 We find that in 2005-2006 around 57 per cent of the total amount of Rs 4 lakh crore of coins and notes introduced in circulation was Rs 500 and Rs 1000 notes and in 2010-2011, it has become 81 per dent of the total value of Rs 12 lakh crores. Meaning that more and more the denominations in circulation are skewed to the very high values when mass of people may need low value denominations. The very high denominations also facilitate ease in transactions in black money. The Government can announce withdrawal from circulations Rs 500 and Rs 1000- notes and replace them with lower denominations like Rs 100 and Rs 50. This can be undertaken in an orderly fashion over a period of say six months and all those who possess the Rs 500/1000 denominations can exchange it with banking channels for lower denomination. It will automatically bring huge amount of funds kept in these denominations into the banking channels and also facilitate black money into banking channels. This is also suggested by Baba Ramdev for sometime now. The Government can decide the nature of penalty to be levied if the amount has not been declared earlier for tax purposes. For instance, for the year 2012-2013, nearly Rs 9 lakh crore would be converted from 500/1000 notes to new 100’s etc. Of course, adequate number of new 100/50 etc notes should be made available from operational point-of-view for this conversion. Since, the RBI is experimenting with plastic notes –the introduction of the same can facilitate durability of the Rs 100 /50 notes.These two steps –creating a threshold limit to cash holding and withdrawing Rs 500 and Rs 1000 currency notes will facilitate reduction in domestic black money transactions – these will not eliminate domestic black money but help in reducing it to some extent the probity in public life comes in an incremental fashion since we have reached the nadir. Are our Parliamentarians and other opinion makers ready for incremental steps at least? Notes of Rs 1000 denomination were demonetised w.e.f. January 16, 1978 and subsequently, re-introduced in 2000-01. Ten Rupee coins are introduced from 2009-2010.
as well as a high importance.